Use this site http://edtechexperience.weebly.com/scratch-challenges.html to see how much you know and remember from our first unit this year SCRATCH! Each challenge has a help video to get you started and even has a sneaky peak box of blocks to use! Which level can you crack? Last Celebration and Stars of the year!! Seb for being kind to his friends. Abi for being caring and helping the pre-school children during the Teddy Bear picnic. Lewis for excellent spelling all year! Lily for being a great helper! Kai for brilliant ideas in his Big Write! Aimee for trying so hard to write more in Big Write!! Finley for creating a great shadow puppet! Lia for creating a great shadow puppet! Reader of the Week – Harlyn Rivers-Halford – Well done!! Emily Dutson for fantastic enthusiasm in her maths session with Mr Homer and a general enthusiasm throughout ALL learning! Kimberley Rogers for a quiet enthusiasm in all her learning and an always positive attitude! Connor Wilson for showing a resilient attitude during our ‘personal aims and achievements’ presentations. Jessica B and Perran for creating excellent poetry in literacy! Mr Paterson for all his hard work organising the Year 6 camp and Production!! We wish all of our brilliant Year 6s a great time on their camp next week and hope they all enjoy the experience! 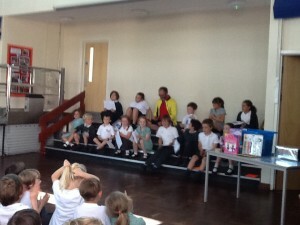 Well done to all the Year 6 bikeability stars!! Well done to Anabel Salmon, Ruby Hammonds, Martha Holmes, Lily and Lani for your brilliant Race for Life run last Sunday – 5km is amazing!!! Lani Groves for the the rainbow run for the Childrens’ Hospice! Amy O’Riordan, Noah, Oak, Marshall, Billy, Arty, Jack for great football skills over the year! Hayleigh Regan for her fabulous performance in her Gymanastics competition! Logan for his prize in the Goonhavern horticultural show for shell crafting! Arty and Zara for great Kwik Cricket Skills!! Well done to all our cricket team for their Kwik Cricket certificates!! Lewis Brown for his Bronze Mathletics certificate! Once again we would like to say how proud we are of the class. Their support for each other this week has been wonderful in desperately sad circumstances. 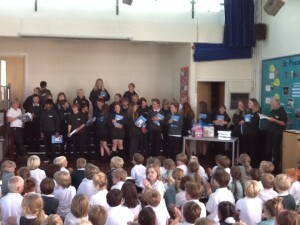 Their behaviour, thoughtful words and beautiful singing at our Special Assembly yesterday was also a credit to them. Just a reminder that is a community balloon release for Esmee at 2.30 on Saturday in Bolenna Park if you would like to come. This week we have also had a visit from our local Fire Safety officer who taught the children how to ‘Stop, Drop, Roll’ if a spark lands on them and also encouraged them to check smoke alarms at home and try to think of an escape route for their family to use if there was ever a fire. They have all been given a booklet from the Fire Service with safety-based activities in it. In maths, the children have been investigating pentominoes – shapes made from 5 squares joined together – it is a tricky investigation which they all worked very hard on. There are lots of activities based on pentominoes if you Google it, e.g. http://www.scholastic.com/blueballiett/games/pentominoes_game.htm . In literacy we have been looking at a story called Caterpillar Shoes – can your child remember all the characters in the story and which shoes they got? Swimming will continue next week so please ensure that your child has their kit on Monday and Friday. We do swimming as our PE sessions this half term, so unless there is a medical reason not to join in, all children should take part. Living where we do, we feel it is vital that the children learn to be confident in the water and become good swimmers. If you have any questions, as always, please drop in to see us or email us on sburns@perranporth.cornwall.sch.uk or esmitheram@perranporth.cornwall.sch.uk. Here are our stars of the week. We are very proud of all of them! 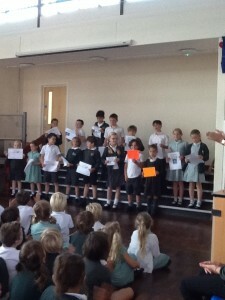 Billy for fantastic effort and progress in swimming! Elise for a fantastic first week at Perranporth and settling in so well! Lukas Skinner and Jack Rowlands for being such great helpers all week! Noah Linney for great maths work! Alfie Earl for super maths skills and effort in subtracting money! Lomay Wilson for always giving 100 percent in everything she does! Sophie Barr for being our reader of the week! Alfie Wright for always showing a smile in his learning! Ruby Geary for showing a positive attitude in all lessons! Hayleigh Regan for a positive attitude and always smiling through her learning! 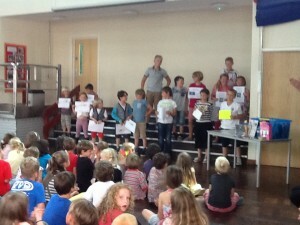 Jake Dodson-Young for being a fabulous helper in Reception Sports Day! Ellie Ansell and Lucas for brilliant homework – well done!!! Luka and Jake for learning their parts for the play brilliantly! Lewis Brown for his great skill in boxing and raising lots of money for charity! Eva Burns for fantastic dancing certificates and awards including your Grade 3 ballet! Well done to all of the school cricketers too, who took part in the Perranporth Youth Cricket Festival! Ben Pickard for fantastic jumping in PE. Reuben Hamilton for fantastic writing and laying your work out so neatly! Shane Thorne for excellent vocabulary during carpet time and in his writing. Ciara Gerty for brilliant singing with the song we are learning. Kai Gray, Lukas Skinner and Callum Thorne – all for fantastic sea paintings!! Alfie McCarthy for fantastic effort singing in assembly. Jade Ansell for making a real effort with her work and showing a growing maturity within her friendship group. Katie Cooper for a fabulous, positive attitude to learning all week. Kayla Thorne for fabulous home-learning – a great effort and lots of lovely story and diary writing! Jago and Kerys for excellent work on plant drawing and recognition. Lewis for consistently excellent home-learning. Lani Groves for always being a good and supportive friend! Joseph Clayton-Jones for brilliant Cornish Dancing. Laura for fantastic effort at Polzeath Golf Course in the Junior competition!